Give your kitchen a sleek, smart and sophisticated look with this 43 pcs coloured stainless steel storage set by Kitchen Queen. The set consists of small, medium and big sized canisters of different shapes. Available in 4 different colours viz. Orange, Purple, White and Yellow, the containers are stackable, nestable, rust- proof and scratch- proof. 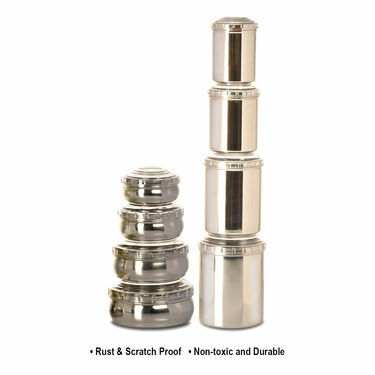 The mirror finish of the canisters adds to your kitchen decor. All containers come with well fitted, see-through, air-tight, poly-carbonate lids to ensure hygiene and avoid spillage. Everybody needs a good kitchen utensil set,whether you are new to cooking or a seasoned chef. And choosing a kitchen cookware or storage set that not only do your cooking chore easy, but also looks appealing is really a tedious task, isn?t it? 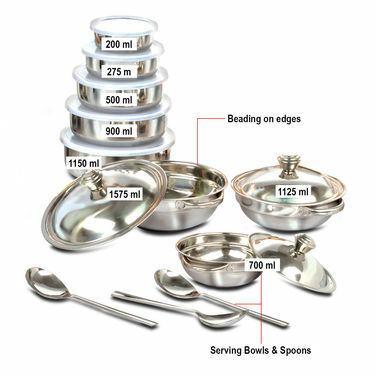 So to make your work easier and to save your valuable time in picking one, we did a quick review on 43 Pcs Stainless Steel Storage & Serving Set. Design & Finishing: Contemporary designs with mirror finishing gives the utensils an upscale look. The beading on the edges reduces the sharpness & prevents it from getting bent or shapeless. The spoons and forks have been beautifully designed to add grace to your dining experience. The ergonomically designed handles ensures grip and ease of use. Reviewer: We highly recommend 43 Pcs Stainless Steel Storage & Serving Set, a complete value-for-money let you prepare & store your food efficiently and hygienically. It is definitely a useful addition to your kitchen or a perfect gifting option for friends. If I am not satisfied with the product, can I return it? Hi, I want to know if these are airtight containers? 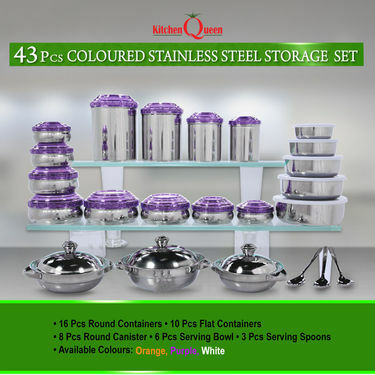 Kitchen Queen 43 Pcs Coloured Sta..VSKitchen Queen 43 Pcs Stainless St.. 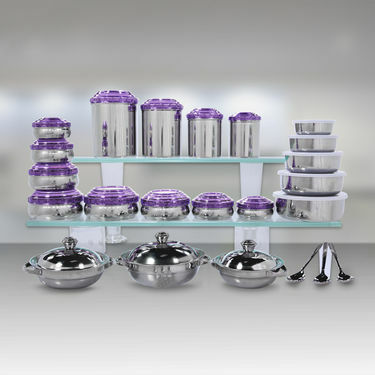 Kitchen Queen 43 Pcs Coloured Sta.. VS Kitchen Queen 43 Pcs Stainless St..